"Yummy, yummy, yummy salad with black beans, rice, corn and other good stuff. Its' a good idea to prepare the rice and barley ahead of time that way you can just throw the salad together." In a large saucepan bring 2 cups of water to a boil. Stir in barley and reduce heat to medium-low, cover and simmer for 40 to 45 minutes or until tender. Let cool. In a saucepan bring 1 1/2 cups water to a boil add the rice. Reduce heat to low and simmer, covered for about 20 minutes or until tender. Let cool. 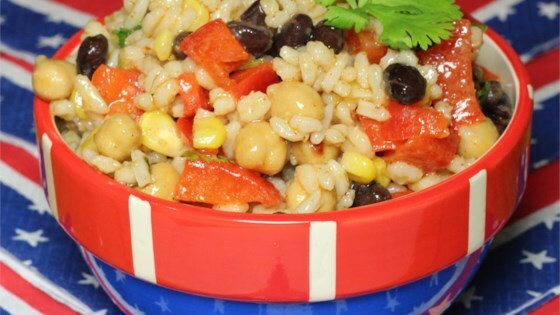 In a large bowl, combine the cooled barley, rice, black beans, kidney beans, corn, onions, red bell pepper and cilantro. Mix well. To make dressing: In a small bowl, whisk together vinegar, garlic, chili powder, salt, red pepper flakes and black pepper. Whisk in oil and pour over salad and toss well. Transfer to a lettuce-lined bowl to serve. I enjoyed this salad; my husband thought it was ok. I thought it was better the next day, after it had plenty of time to chill in the fridge. I will make it again. I love this recipe - I've made it several times. I add more rice (3/4 cup cooked in 2 1/4 cup water) and have some green Tabasco sauce on the table. Everyone always raves!